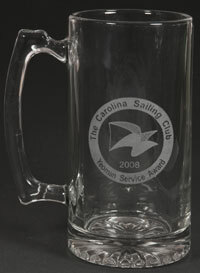 This 25 oz heavy glass beer mug makes a great keepsake. These are engraved on a rotating fixture so the image curves around the surface. They can be engraved on either side (for reading either left or right-handed). The engraving can be up to 2 inches wide. Quantity discounts apply.